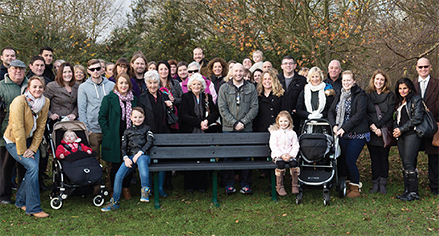 FAMILY and friends of much-loved local men Pete Oldfield and Kris Cook gathered on the banks of Goldsworth Park Lake on Sunday for the unveiling of a commemorative bench which has been installed in their memory. Sitting proudly on the eastern bank of the lake, at the site of the former Woking Water Activity Centre, the bench is the culmination of months of planning by those closest to Pete and Kris, who wanted a permanent tribute for the keen water sports duo, who had been permanent fixtures down at the WWAC themselves during the 1980s and ’90s. 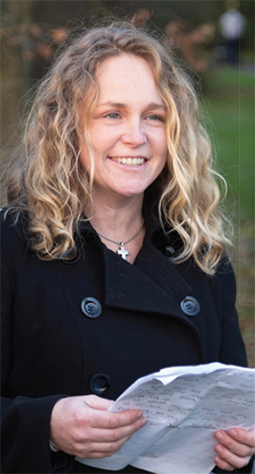 Close friend, Mandy Watson, who led the intimate gathering, said that the idea to install a bench was actually over three years in the making after WWAC founder Pete, 67, passed away in 2010. When Kris, 36, then tragically passed away earlier this year after suffering a fatal cardiac arrest while taking part in the RideLondon cycling event in August, the families and friends got together to commemorate both men at a place that holds such fond memories. Alongside poignant words from Mandy, those who gathered also heard from Woking & Sam Beare Hospice Chief Executive, Nigel Harding, who praised the bench as a ‘wonderful tribute to two inspirational names who meant so much to Goldsworth Park’. Kris and his team-mates were raising funds for the hospices at the RideLondon event. At the time of writing, the fundraising total on Kris’ JustGiving page alone stands at more than £50,000 – one hundred times his original £500 target, with donations still coming in. Mr Harding added that the hospices plan to dedicate a physiotherapy room to mark Kris’ incredible efforts for the charity once they have moved. Their new premises will be located just a stone’s throw across Goldsworth Park Lake, in Denton Way – due to open in late 2016. Following on from Mr Harding, Mandy shared further memories of a then eight-year-old Kris and younger brother Steven first joining the WWAC family, with the brothers enjoying endless hours of pursuits on the lake around their school studies and even during work lunch breaks in later years. Kris quickly developed a natural aptitude for windsurfing. Indeed, such was his newfound love of life on the water that his mother, Sue Cook, vividly remembers him once planning ‘to be a beach bum and teach water sports until he was 35 years old’. It was in fact during an early job at Lake Bala in Wales where Kris was headhunted to work with social services, which eventually lead to him excelling in a career working with young offenders – a career which, Sue says, owed much to Pete’s early guidance. Pete’s endless hours of work in the community and down at the activity hut – fitted around his day job as a plumber – were also fondly recalled by Mandy, who said that the idyllic and peaceful location of the bench will serve as the perfect place for quiet contemplation, but also one to remember happy times at a place where they shared so many fun-filled days. The dedication concluded in fittingly upbeat mood, with a blast of The Beach Boys’ 1963 hit Surfin’ USA – or as the WWAC crew knew it, Surfin’ at the Lake. THERE is still time if you would like to make a donation to Woking & Sam Beare Hospice, via Kris’ JustGiving page. Visit www.justgiving.com/kris-cook to make a pledge.